3. Choose a payment option from the left side. 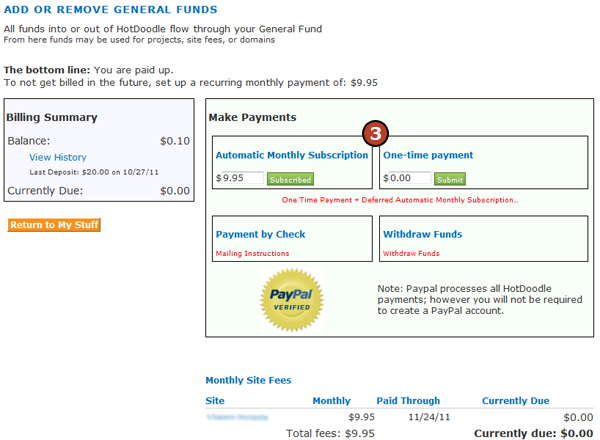 This screen wil also tell you if you have a balance due and how much you need to pay for automatic monthly hosting. Automatic Monthly Payment – This option allows you to make automatic monthly payments for you website hosting. Enter the monthly amount in the box ($9.95 for Basic Hosting, $24.95 for Dynamic Hosting) and click the "Subscribe" button to setup monthly payments for that amount through PayPal. One-time payment – This option allows you to make a one time payment on your account for an overdue balance or to pay for contracted work associated with your website. Enter the one time payment amount in the box, and click the "Submit" button to make a one-time payment. You do not need a Paypal account to use this option. One-time payment + deferred automatic subscription– This option allows you to make a one time payment on your account for an overdue balance, wait some days, and then start an automatic monthly subscription. This is a great way to catchup on a late site and then start just-in-time payments. Payment by check – You can also pay your account by check using the address provided. There is a $100 minimum for check payments. 4. Follow the instructions from PayPal to complete the payment. If you don’t have a PayPal account, click on the “Continue” link and follow the instructions provided by PayPal.